We are very pleased to introduce to you our newest Swim Guide Affiliate: The Friends of the Cheat. The Friends of the Cheat join Swim Guide as an affiliate just in time for the summer monitoring season. 2) To foster a cooperative effort by state and federal agencies, private industry, academics, grassroots organizations, and local landowners to address the severe AMD issues in the Cheat River watershed. The Mapping and Monitoring Program was developed by FOC staff in 2003 to identify and prioritize acid mine drainage (AMD) sources in the lower Cheat River watershed. Since 2003, over 5,000 samples have been collected at over 600 sampling locations during reconnaissance and routine monitoring. In 2011, Friends of the Cheat launched a volunteer monitoring program, the Cheat Aquatic Pollution And BaseLine Ecological (CAPABLE) Monitoring Program, to collect baseline stream data in tributaries threatened by natural gas drilling and other sources of impairment. New for 2017, Friends of the Cheat is beginning a new bacteriological monitoring program to test several Cheat River access locations for total coliform and E. coli. Monitoring these sites will help inform the public determine where to swim and paddle to limit their risk of getting sick from bacteria in the water. Thanks to their monitoring program recreational water quality information is now available for 8 sites on the Cheat River. As part of the Friends of the Cheat’s efforts to promote the outstanding natural qualities of the Cheat the group has developed and maintained several important river access points so that residents and visitors alike can engage in paddling, fishing, and other recreational water activities. Read more about the Friends of the Cheat and visit their monitored sites here. The Cheat River watershed drains approximately 1,422 square miles in northeastern West Virginia, southwestern Pennsylvania and western Maryland. The watershed spans five West Virginian counties including Monongalia, Preston, Pocahontas, Randolph, and Tucker, while only a small portion of the watershed reaches Fayette and Garrett counties in Pennsylvania and Maryland respectively. Read more about West Virginia, and water monitored in the state. Every year, during the first week of May, the FOC host the Cheat Fest. 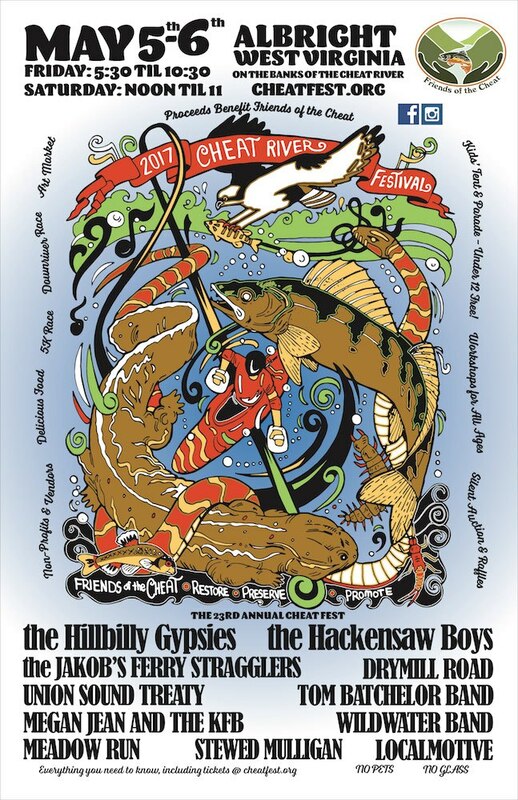 Cheat Fest 2017 is May 5th and 6th, 2017. Gates open Friday night from 5:30pm to 10:30pm, and Saturday from 11:30am to 11:30pm. Find out more about this annual fundraiser by clicking the poster.